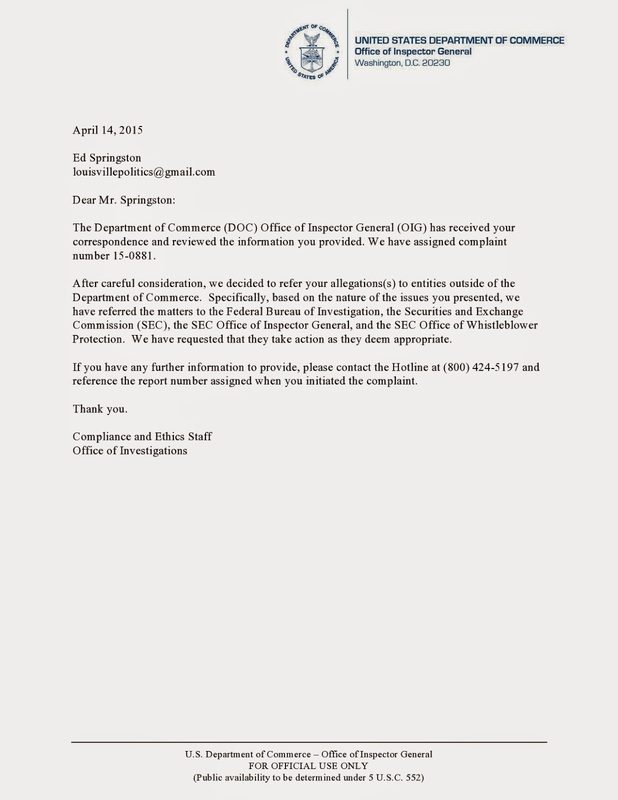 The Department of Commerce has requested an investigation by the FBI, and the SEC, as well as, provided whistle blower protection. The lid has come off. It all started a few years ago when the auto industry was going under. Many media outlets in 2007 were outwardly proclaiming that this was the "death of Ford." They were not far off. If not for the efforts of Jay Morgan. According to Morgan's complaint, working on behalf of Ford Motor Company, he is the one who orchestrated the $25 billion manufacturing plant retooling program the government agreed to that Ford had to have to survive. Working with Senator Debbie Stabenow, Rep. John Dingell, and then Speaker of the House Rep. Nancy Pelosi, Morgan is the one who made it all happen. In September 2009, the Department of Energy issued a nearly $5.9 billion loan from the Energy Department’s Advanced Technology Vehicles Manufacturing (ATVM) Loan Program, enabling Ford to upgrade 13 factories across Illinois, Kentucky, New York, Michigan, Missouri, and Ohio to state-of-the-art assembly and manufacturing plants capable of flexibility producing multiple-platform, fuel-efficient advanced technology vehicles in response to changing market demands. So why did Kentucky give Ford over $300 million? We will get to that in a later story. While GM and Chrysler were taking so called "bailout" money, Ford took the lion's share of the loan money, $5.9 Billion of our taxpayer money, at 1/2 of 1 % interest rate with no timetable to repay the loan. While Ford was outwardly proclaiming they didn't need the government bailout it was all a ruse. Ford received billions of our money for what can only be interpreted as a bailout at practically no cost. Where else can you go and get a so called "loan" with no repayment plan in place for the principal at practically no cost for the loan and not call it a "bailout?" While GM and Chrysler have reported paying back their "bailout" funds, has Ford paid back the $5.9 Billion they received during this time of excellent profits? They have enough money to almost max out profit sharing to employees, what about the taxpayers who funded their profits? The stock hit anemic levels in 2007, at around $2 a share, when Morgan's associate JT Young attended a Department of Energy and Treasury briefing that let them know Ford would get bailed out. Soon thereafter he bragged about buying up Ford stock. Morgan did as he was trained by Ford to do and reported it. In 2007 Ford faced another hurdle. The Democrats received control of the House of Representatives and Ford's lobbying group were predominantly Republican and hired from former President George Bush's White House staff beginning with Ziad Ojakli. With Ziad Ojakli in charge, Ford's Government Operations lobbying team had become a Republican based group that would not sit well with a Democratic House so in February 2007 Ojakli hired Democrat Bruce Andrews as Morgan's boss. Ziad Ojakli himself stated that, "Andrews' ties to the Blue Dog caucus in the House make him "a perfect complement" for Ford's team." By October 2008 Morgan had reported the insider trading by JT Young and Andrews left a few months later in February of 2009. Andrews left Ford and gave up an approximate $500k salary to go back to work for the Senate in the public sector for about $125k. Why did he leave so quickly? Why did he give up such a high paying job so soon after the insider trading allegations? Why did he leave before the $5.9 Billion was released in September of 2009? We will answer some of those questions soon but Bruce Andrews was confirmed as the Deputy Secretary of Commerce on July 24, 2014. Even though every insider knew of the allegations. He was also a founding member of lobbying firm Quinn Gillespie & Associates who did pretty good during the years 2007 when they were founded through 2010. Did Andrews share information there? Who knows but total lobbying spending for Quinn did pretty good as part of the total lobbying spending that increased from $2.7 Billion in 2007 to over $3.5 Billion in 2010. Not bad for a 3 year period. Did Ford or Ojakli want to hide Andrews quickly and quietly? Did they help Quinn with their start up while Andrews touts himself as a "founding member" on his own bio? What was the promise made if he cooperated? Did someone promise Andrews the $1 million a year job when Ojakli retired? It is common in the corporate world for top leadership to be on contracts. In most cases those contracts are in 4 or 5 year increments. At Ford most know that after 10 years, or 2 five year contracts have been completed, the person on contract can retire. Ojakli is now eligible for retirement.Thanks to our outing of the Morgan allegations if that deal was made it is now gone. According to Marketwatch Ziad Ojakli has done quite well since 2008 on stock sells. In January 2011 for example, at the peak of Ford's resurgence on the stock market, Ojakli sold off almost 110,000 shares for a over $1.9 million. Not bad but were these shares bought at $2 a share based on the JT Young insider trading allegations that Ziad was so angry at Morgan about? That is one heck of a payday if proven true. The SEC investigation can find that easily. 110,000 shares at $2 apiece is about $220,000 compared to selling them off for $1.9 million. Once Bruce Andrews left Ford, in April 2009 Ojakli pulled in yet another comrade from his Bush White House days in Pete Lawson. Lawson informed Morgan that Ziad was still "pissed off" at him over the insider trading allegations. Lawson disappeared within 3 years and rumor has it that it was because of a vehicle accident he was involved in. Perhaps that is why Ford announced that Lawson was leaving to start his own consulting firm. Guess who his first client was. In 2012 none other than JT Young, was promoted at Ford to a position of influence over Morgan. Yep the man who was accused of insider trading by Jay Morgan and who had Jay Morgan fired less than a year later. We will be divulging more going forward including stock sales and transfers by Ojakli, and others, and more info on just how deep this goes.